Marcus Brothers Aged Muslins provides the inspiration for this 12 month Block of the Month quilt by Krisanne Watkins. The rich saturated hues of this hand dyed fabric collection ensure any quilt block can become a Star. Stargazing is set up as a 12 part Block of the Month. 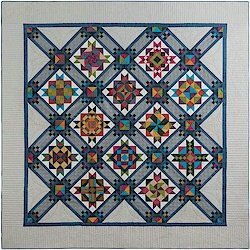 Within this time frame, you will receive the fabric and individual patterns necessary to complete the 73 blocks in the quilt center, along with all the fabrics for the diagonal setting triangles, outer borders and binding. Twelve of the blocks are named for a star or constellation. Finish size for this quilt is 92 x 92. Price: $ 19.99 per month plus shipping ..... there is no registration fees .... or $ 239.90. If pay all at once this is a FREE shipping item. This is available now complete as a kit or block of the month. This kit is ready to go now.